In the game, you start off in the hub village of Pokémon Paradise. This area is a town filled with Pokémon which you can build up using Pokémon you befriend to make various stores as you rank up from various missions. 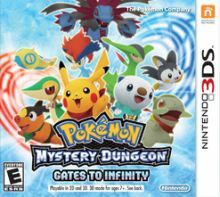 This game is also the first Pokémon game to include Downloadable Content, with 12 dungeons being made available after release. These dungeons all allow for easier access to rare Pokémon and items, which are normally hard to find within the game. Another new feature is the special Companion mode. At any time during the game, when not inside an actual dungeon, you can switch the Companion Mode where you control one of your other Pokémon while you and your partner Pokémon are away. This allows you to collect more items by partaking in missions. In addition to this, an offshoot of the mode allows for 4 player local play where you and up to three friends can partake in special missions co-operatively, including facing off against rare Legendary Pokémon.